March is a huge month for art in San Antonio. For the past 30 years, the Contemporary Art Month (CAM) celebration of art and artists has become a staple of the local arts community and is one of the most anticipated events for artists and art lovers alike. The CAM calendar is filled with a wide variety of art exhibitions and fun events at local galleries, studios, museums, and other venues. The exhibited works for “Yet to be Determined” explore the unfolding of narrative trajectories resulting from everyday choices that are made and the contexts that influences those decisions, or negotiations. They aim for heightened awareness of how actions made in one moment influence what we often refer to as destiny. The nine artists in More than Words: Text-Based Artworks make text works that run the gamut from subversive social comment to rapturous meditation. Each will give you an unexpected occasion to pause. Parallels is a show featuring 11 artists exploring color, line, shape, and composition. In it's fourth run, this year promises to offer several performances, installations, video, and a puppet show! The tradition of a fresh line up of artists continues with nine incredible artists who engage with the rooms, each offering a unique experience. A celebratory show in honor of the impressive works that are being produced by female artists in the San Antonio arena. New paintings by Alejandro Augustine Padilla. This presentation will attempt to explain how the aesthetic appeal of the female form and our understanding of body image has changed throughout history. From the round bellied stone figurines of the Prehistoric, and the shapely forms of the Renaissance, to the androgynous and emaciated models of recent years, the workshop will examine how the concept of the ideal body shape has drastically transformed over time, ending with our own image obsessed contemporary age. 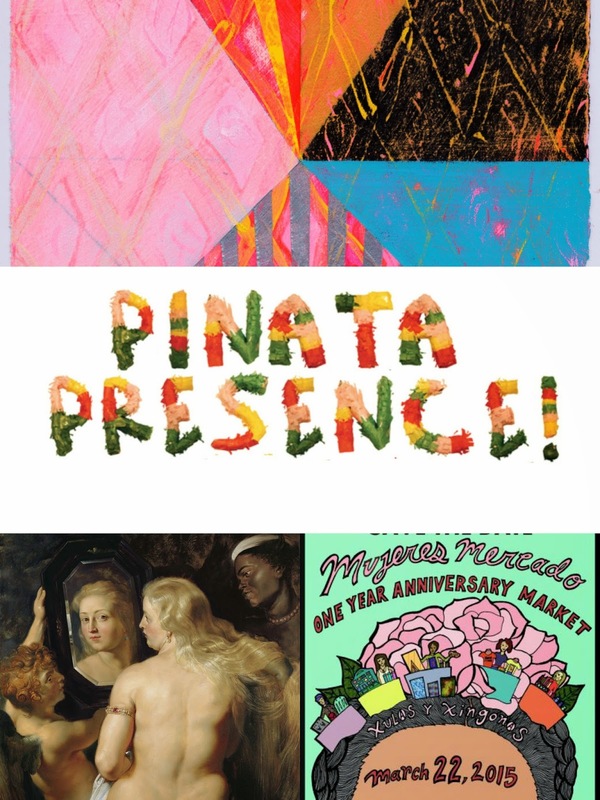 Piñata Presence is an ongoing interactive art project in which artists Shannon Gowen and Gabriella Santiago create temporary site-specific pop-up piñata installations as a means of activating downtown San Antonio. Visitors will have a chance to see work by the artists, and engage in discussion. Mujeres Mercado (MM) partners with local non-profits and organizations to create handmade marketplaces and cultural spaces that (w)holistically support and connect women artisans, traditional healers and merchants, building their own alternative economies. Cabinet of Curiosities showcases original multimedia artworks created by fourteen artists. Touching upon themes of international politics, nature, cultural memory, decorative arts & technology, each artist creates a unique dialogue via the art object’s size & materials. The technical specificities in such small formats challenge the grandiose nature of art in museums or galleries & beckons the viewer to engage in an intimate relationship with the artworks. There is a newly-formed cabinet of curiosity created by this exhibition, one that is formed not by parading oddities but is fused by the shared display of a contemporary creative dialogue. These are just a few of the many events going on this month, so I hope you will check out the CAM Calendar and find your picks. Support local art and have fun this March!